If you look at some amateur car audio forums and Facebook groups, you’ll see a disturbing trend of people using speakers that are intended for home applications in their cars. While these speakers initially seem to offer impressive performance for their price, they simply aren’t designed to withstand the challenges associated with a mobile audio system. In this article, we’ll delve into what makes a “real” car audio speaker the only choice for your next sound system upgrade. Why Is the Car Audio Environment Different From Your Home? We’ll get into the environmental challenges of car audio systems shortly, but the biggest difference between listening to music in our cars or trucks and our homes is the volume level. If you are really into a song and decide to crank up the music in your car, volume levels can easily exceed 110 to 120 dB. This volume level taxes the power production capabilities of your amplifiers and, of course, gives your speakers a thorough workout. Trying to listen to music at that volume level at home would quickly result in your neighbors calling the police to register a noise complaint. Quite simply, we listen to our car stereos at much higher volume levels than we do at home, and each speaker in the system needs to be able to handle a lot more power. Marketing departments often take advantage of the topic of speaker power handling to inflate the perceived quality or value of a speaker. Printing a “peak power” number that is four or five times the continuous power handling number is functionally useless. Useful power handling specifications define two numbers. The continuous power handling specification, also called the RMS power handling spec, is the amount of power that the speaker can handle indefinitely. Most companies test the power handling abilities of their speakers using pink noise that approximates the musical energy distribution found in music. The peak power handling specification takes into account the dynamic nature of the music we listen to. Modern rock or pop music has a crest factor of 10dB. The crest factor means the quiet parts of the track are, on average, 10dB quieter than the loudest parts. It’s important to note that the operating frequency range is a fundamental and important part of this specification. We wouldn’t feed a midrange driver bass frequencies below 60Hz and likewise, wouldn’t feed a tweeter midrange and bass information below 1,000Hz. The number one reason speakers fail is that they can’t withstand the heat created by the power sent to the speaker. One relatively easy way to compare the thermal power handling capabilities of a speaker is to look at the diameter of the voice coil. Larger coils can handle more power because the heat is spread over a larger area. High-quality speakers with accurate power handling specifications will typically have relatively large voice coil formers for the given speaker size. A 6.5-inch midrange designed to handle a true and genuine 100 watts of power will need a voice coil that’s at least 1.5 to 2 inches in diameter to dissipate that thermal energy. You can tell a lot about the knowledge and experience of a speaker designer by analyzing the specifications and features of an entire series of speakers. How one speaker is intended to work with the models that operate in adjacent frequency ranges is quite telling. For mid-range and mid-bass drivers, power handling is a significant consideration, but so is excursion capability. In terms of speaker specifications, the Xmax spec describes how far forward or backward a speaker can move linearly. If you double this value and multiply it by the effective cone area, you get the total volume of air a speaker can displace. In most cases, more excursion capability means two things: more output capability and, when designed properly, improved linearity when operated at lower excursion levels. A speaker that can handle a lot of power but can’t move very far without distortion isn’t much use as a mid-bass driver in a high-power system. Most 6.5-inch midrange and mid-bass drivers have Xmax specifications of at least 4.5 mm in each direction. With that said, some exceptional designs offer twice that specification. In home audio, the crossover point between a woofer and a midrange driver is typically much higher and as such, home audio drivers simply can’t keep up. Sure, at low volume levels, this isn’t an issue. When you want to crank things up, hearing a voice coil former crash into a bottom plate is cringe-worthy. 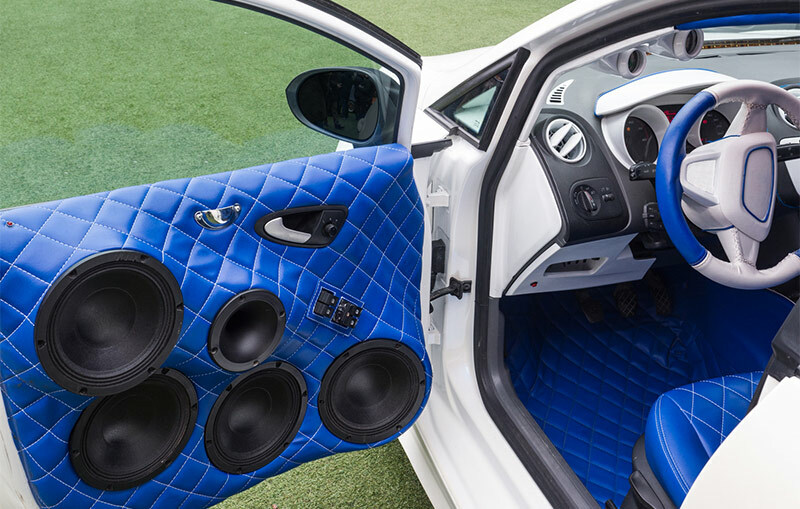 For a true car audio speaker, the challenge of ensuring the driver design’s reliability means that the speaker needs to be tested in the same environmental conditions in which the speaker will operate. Companies that have detailed testing procedures and own or work with experienced and properly equipped factories have extensive processes that involve both extremely low and high temperature and high humidity tests. We are talking about low temperatures that would result in an extreme cold weather warning in most cities and high temperatures that exceed world-record setting conditions. Likewise, extensive testing will include both low and high humidity conditions. North America doesn’t rank as the most humid place in the world, but states like Florida, Louisiana and Texas do see their fair share of humidity. Southeast Asia, on the other hand, registers 100 percent humidity almost all the time. A speaker design engineer needs to take humidity into account, especially when the design uses a pulp or pressed paper cone that can absorb moisture. Coatings must be applied to ensure the speaker parameters don’t change, and adhesives must be chosen to ensure reliable bonds between components. Humidity can also cause corrosion on exposed carbon steel components in the motor structure and chassis design if they are not coated. Face it: Speakers designed for car audio applications are essentially outdoors and exposed to ultraviolet radiation. You can imagine the importance of using designs and materials that can withstand UV in a marine application, but conventional car audio speakers that are mounted in the dash or rear deck of a vehicle see similar amounts of sun exposure. UV exposure will cause what is known as UV degradation. Synthetic polymers like polypropylene and synthetic rubbers that do not include UV stabilities will discolor quickly, develop a chalky surface, crack or, in some cases, disintegrate completely. A change in color does not necessarily affect the performance of a speaker. If the damage continues, though, the weight of the speaker cone may be affected, and the compliance (stiffness) of the suspension may change. The result will be unpredictable performance and eventually complete failure. Loudspeaker drivers designed for home audio applications only have to withstand the vibrations that the speaker system itself creates. In a mobile environment, our cars and trucks impose huge physical forces on the speaker. Bumps in the road can yield high g-forces that multiply the weight of the motor structure several times. Likewise, an out-of-balance wheel and tire can cause vibrations that are felt through the entire vehicle chassis. The fasteners and materials used to assemble these speakers and the mounting and installation hardware must withstand these vibrations at both low and high frequencies. Manufacturers of high-quality speakers will use industrial vibration tables to test the suitability of the design and materials. Most companies guard their quality control and qualification testing standards closely, making it effectively impossible to search for that information. When you are shopping for speakers, look around the retailer’s showroom to see what they have on display. Ask to see what a new speaker looks like and hold it next to one that has been on a display board for a few months or years. If you see discoloration, that could be a sign that the materials chosen may not be up to the challenge of the automotive environment. Next, choose speakers from reputable car audio brands that focus on engineering rather than marketing. If you don’t have time to do the research for yourself, ask your local mobile electronics specialist what makes the brand you are interested in better than its competitors. If they can’t provide an answer based on physical features and designs, it might be worth continuing your shopping. To be clear, “They sound great” or “Lots of competitors use them” aren’t valid answers. Oh, and don’t be fooled by “price marketing.” Just because one speaker is more expensive doesn’t mean it has more features and technologies that make it sound good, or that it has undergone proper design testing. Last and most certainly not least, make sure you audition the speakers you intend to buy and compare them to other offerings. The key to a quality speaker lies in its lack of distortion and its clarity, especially at high volume levels. If you find a solution that is well-designed and sounds great, you will be able to enjoy your music for decades to come. Visit your local mobile enhancement retailer today to find out what automobile-specific options are available. They’ll be a worthy investment!